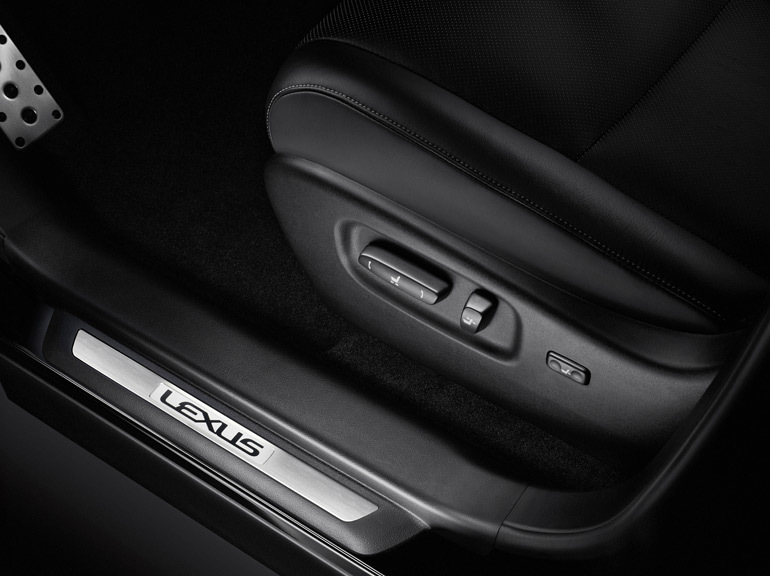 Paving the path for a luxury hybrid crossover vehicle, Lexus has been at the forefront for many years taking the excellent and proven platform of the RX SUV and utilizing their historic hybrid know-how to add extra efficiency. 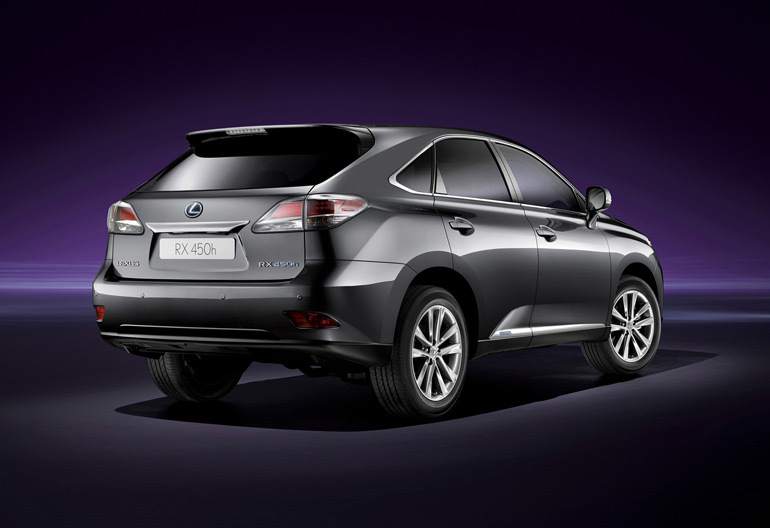 Since its conception in 2008 as the RX 400h, the Lexus RX hybrid has been a major staple in a rather miniscule hybrid SUV segment. 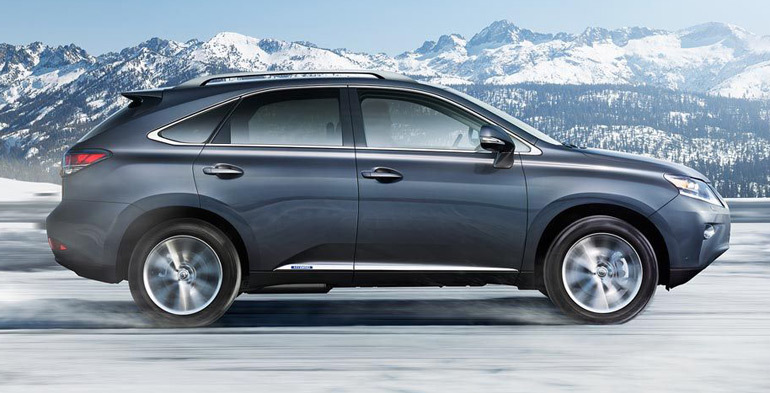 Taking a quick recap and spin in the 2014 Lexus RX 450h Hybrid reminds me of why the brand has stood out among others to offer such an compelling vehicle, one that appeals to the fuel mileage conscious who want a little extra utility yet still laced in true luxury. 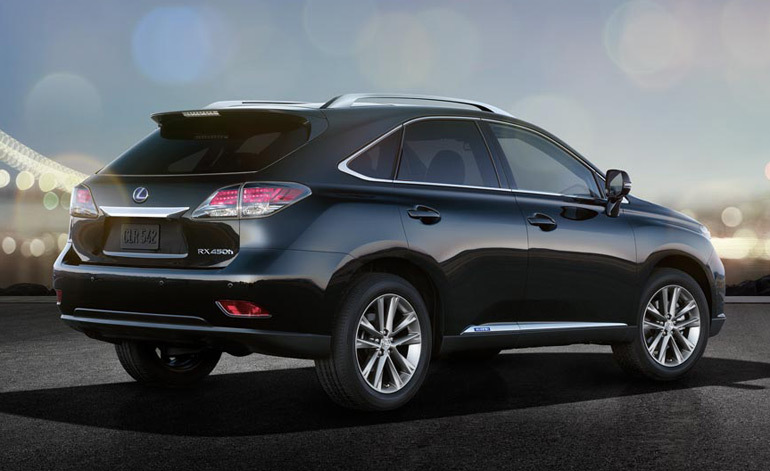 The 2014 Lexus RX 450h Hybrid is a good culmination of what the RX 350 has brought to the luxury crossover utility segment while the hybrid trait adds additional efficiency without taking anything away from what the RX offers in terms of luxury, performance and utility. 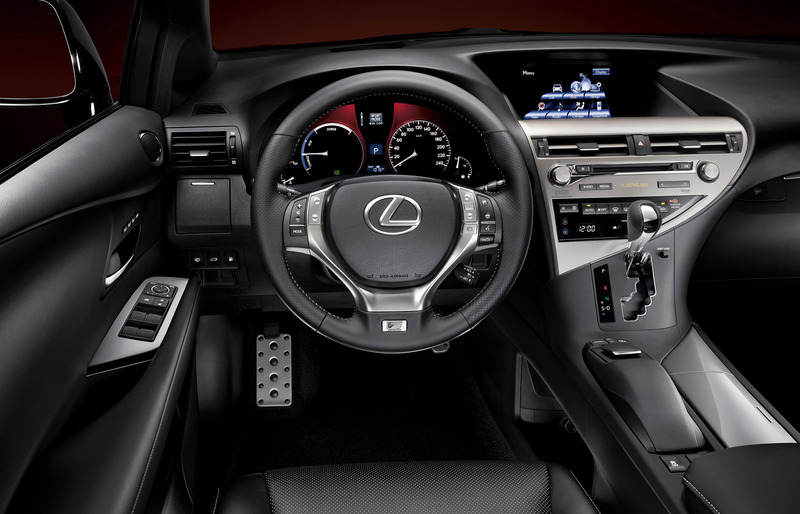 The 2014 Lexus RX 450h remains mostly unchanged from the previous year, with the exception of adding a rear power 115-volt power outlet and the integration of Siri Eyes Free for users of newer iPhones. 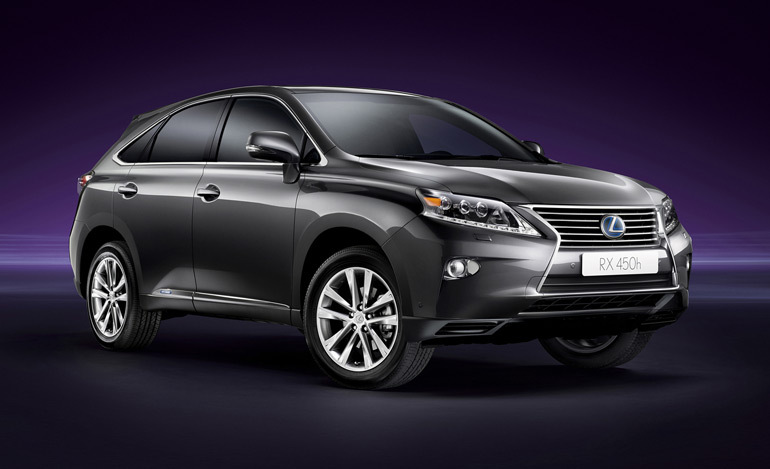 The 2014 RX 450h gets the same 3.5-liter V6 engine only it is coupled with two electric motors, one acting as the starter and generator while the other is used to propel the front wheels in the standard trim. All-wheel-drive RX 450h models get a third electric motor to drive the rear wheels. Total system output power is rated at 295 horsepower and is directed through a CVT transmission (Continuously Variable Transmission). The performance of the 2014 Lexus RX 450h is surprisingly lively, slightly more power to work with over the gas-powered RX 350 sibling. 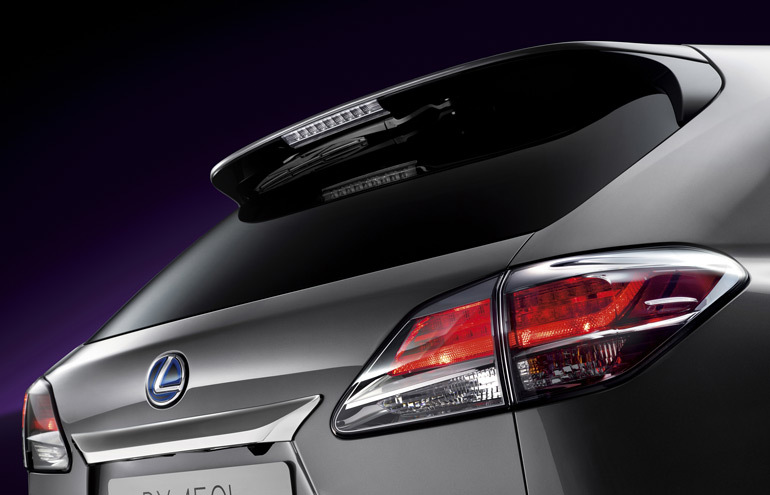 The CVT unit, among the best in the business, adapts quickly to your throttle inputs when the engine power kicks over. 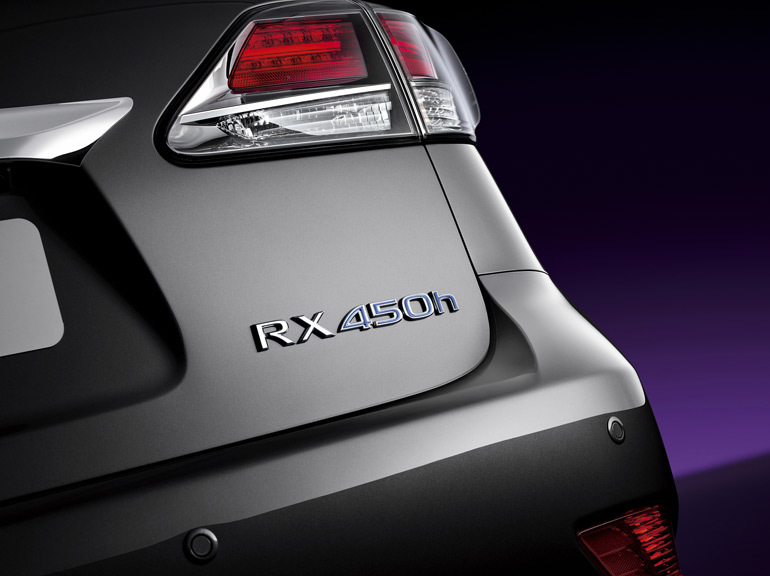 The instant torque from the electric motor aids in getting the RX 450h moving from a stop. Thriving off of the Toyota Prius’ hybrid synergy drive system, the RX 450h utilizes the same principles only with much more power. Sixty mph from a stop comes in at about 7.5 seconds. There hardly ever is a time that the RX 450h feels sluggish or exhibits a slow response of the CVT’s ability to get the V6 engine’s power band in the sweet spot for acceleration. Moreover, the RX 450h displays a bit of torque steer and front wheel spin from the surging power, mostly coming out of turns or initial starts at full throttle. Traction control steps in but never to the point of retaining power to the point that you can’t get out of the way of oncoming traffic. The sporty character the RX 450h is mostly hidden under its common looks but the luxury hybrid SUV handles decently for a crossover, ensuring confidence on the road within the confides of legal limits. The electric steering rack is surprisingly heavy, potentially to give off an air of sportiness due to the lack of road feedback transmitted to the driver. The hybrid drive system is mostly seamless in its transitions from electric power to the gas engine. However, sitting at a stop when the engine decides to fire off to either charge the battery or heat up in cold weather, the jolt is somewhat startling and tends to shake the whole vehicle. Aside from that, the smooth transitions on the road come on at the benefit of being extremely efficient, to the point of a combined 30 mpg. EPA fuel economy estimates for the RX 450h are 32 mpg city and 28 mpg highway. These figures can greatly fluctuate, mostly in favor of better numbers when you are a conscience driver monitoring your dashboard power gauge often. I saw figures as high as 34 mpg on the highway traveling around 55 mph and as much as 35.5 mpg in the city when taking advantage of the generated and stored power in the battery by monitoring the live battery meter. 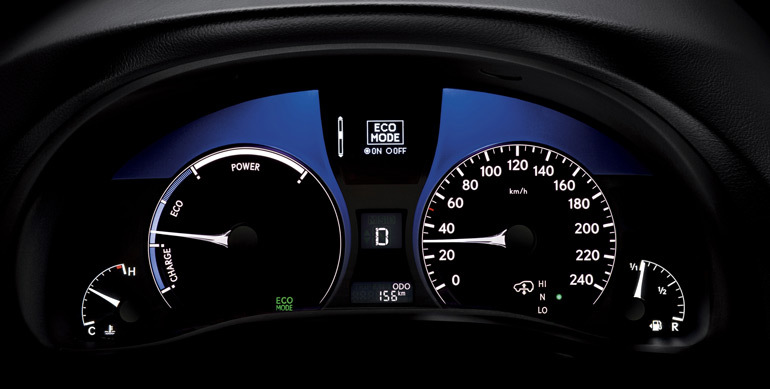 The active power gauge is an essential part to Toyota and Lexus’ hybrid vehicles where specific markings determine points where the engine will kick over versus modulating the throttle to continue battery power until it depletes enough to have the engine charge the system. Another aspect to note about the RX hybrid is that it has a high rate of deceleration possibly due to its attempt to recover energy from the regenerative braking. Nevertheless, the aggressive deceleration takes a bit to get used to, but benefits to keep the battery charged up, which helps capture those decent fuel consumption numbers. 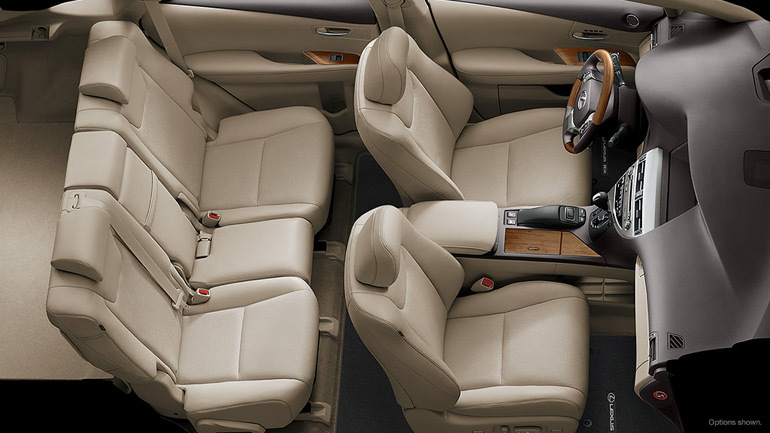 The luxury appointments and interior of the 2014 Lexus RX 450h hybrid are on par with its RX 350 sibling. 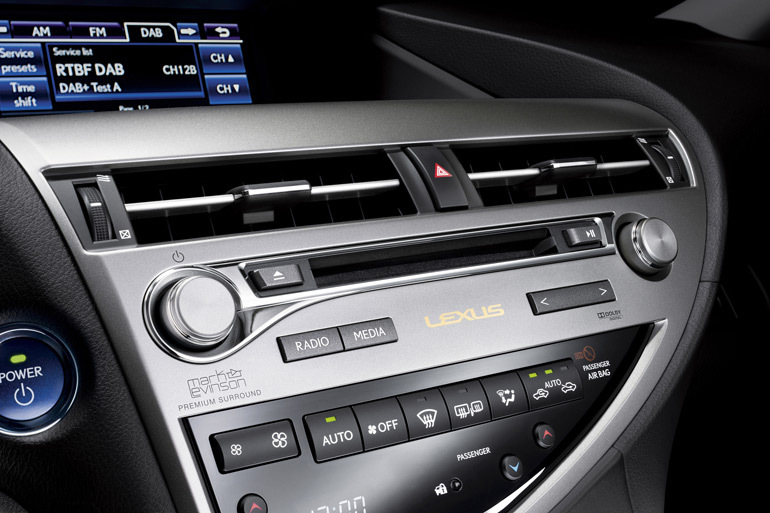 Much of the interior remains the same, exuding the top-notch fit and finish that you expect from Lexus. 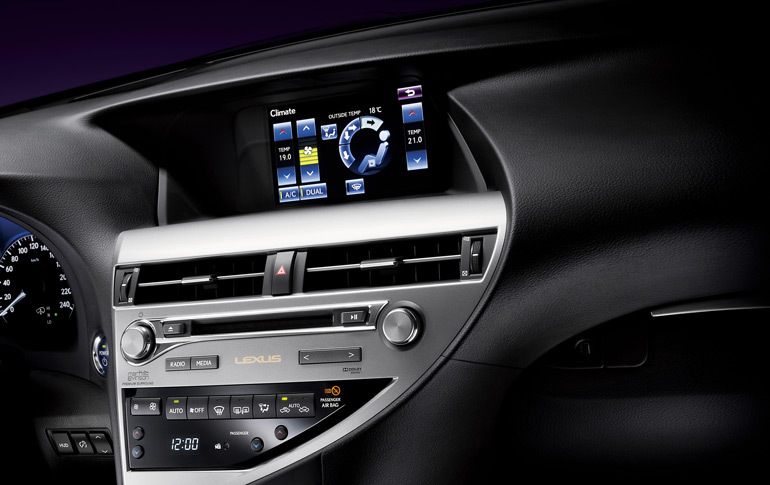 The somewhat-quirky Lexus Remote Touch system, a mouse-like device for controlling the GPS navigation system, audio system, and vehicle settings, remains to be an acquired taste for some. Added on to my test vehicle as options are the Premium Package (leather trim interior, power moonroof, driver’s seat/steering wheel memory, electrochromic heated outside mirrors and blind spot monitor), Dual-Screen rear seat entertainment package including wireless headphones and remote, Mark Levinson Premium Surround Sound Audio system, GPS navigation system with voice command, backup camera, SiriusXM NavTraffic/Weather/Stocks/Sports/Fuel Prices and heated/ventilated front seats. 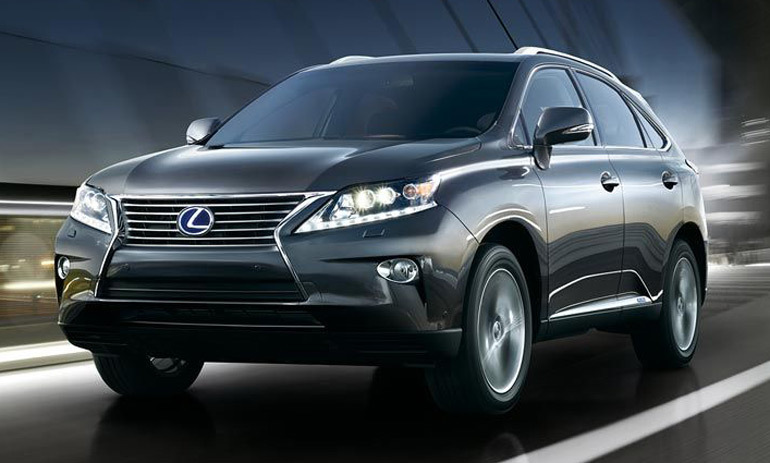 Many of these high-sought-after options are essential to completing the RX 450h’s package in being a stand-out luxury crossover utility vehicle. Otherwise, the exterior styling and persona get lost in translation with every other crossover vehicle found in American suburbs. The starting price for the 2014 Lexus RX 450h Hybrid starts at $46,410 and ramps up to an as-tested $56,445 for my nicely-optioned test vehicle.